The only desktops that are supported for virtual desktops in Horizon View 5.3 are Windows-based. This includes the latest versions of the Windows Desktop operating system and Windows Server running Windows Terminal Server or as a desktop. Because Windows desktops are the core of Horizon View, Active Directory is used to handle authentication into the View environment. As I mentioned in my last post, an Active Directory environment is a requirement. Per the documentation, Server 2003 and Server 2008/R2 Active Directory environments are supported. The documentation doesn’t go into any details as to whether Windows Server 2012 domain controllers are unsupported or if the Server 2012 domain and forest functional levels are unsupported. 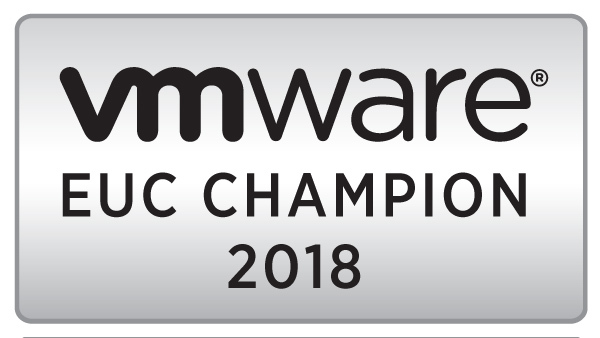 Optionally, you may want to set up an organizational unit for any security groups that might be used for entitling access to the Horizon View desktop pools. This can be useful for organizing those groups and/or delegating access to Help Desk or other staff who don’t need Account Operator or Domain Administrator rights. The first think that we need to do to prepare Active Directory for a Horizon View deployment is to create an organizational unit structure for Horizon View desktops. This OU structure will hold all of the desktops created and used by Horizon View. A separate OU structure within your Active Directory environment is important because you will want to apply different group policies to your Horizon View desktops than you would your regular desktops. There are also specific permissions that you will need to delegate to the View Composer service account. View Desktops is a top-level OU (ie – one that sites in the root of the domain). I like to set up this OU for two reasons. One is that is completely segregates my VDI desktops from my non-VDI desktops and servers. The other is that it gives me one place to apply group policy that should apply to all VDI desktops such as disabling non-essential services, turning off screen savers, or setting the inactivity timeout to lock the machine. I create three child OUs under the View Desktops OU to separate persistent desktops, non-persistent desktops, and desktop templates. This allows me to apply different group policies to the different types of desktops. For instance, you may want to disable Windows Updates and use Persona Management on non-persistent desktops but allow Windows Updates on the desktop templates. You don’t need to create all three OUs. If your environment consists entirely of Persistent desktops, you don’t need an OU for non-persistent desktops. The opposite is true as well. Finally, I tend to create department or location OUs underneath the persistent or non-persistent OUs if I have locations that require special Group Policy settings in addition to the default settings. One example where I used this was in a previous job that HEAVILY used Microsoft Access databases at one site. Microsoft Access includes a security groups option that uses a centrally stored database file to manage access to databases. This can be configured with group policy, and since other locations used Access without the security groups configured, applying that policy to all desktops would have broken any Access databases that the other locations used. These grandchild OUs are completely optional. If there is no need to set any custom policy for a location or a department, then they don’t need to be created. However, if a grandchild OU is needed, then an entire pool will need to be created as desktop pools are assigned to OUs. Adding additional pools can add management overhead to a VDI environment. There are two service accounts that need to be created in Active Directory to support a Horizon View deployment. The first is the account that will be used by View Composer. This account can be created as a standard domain user. This account should not have domain administrator or account operator rights – it only needs a select group of permissions on the OU (or OUs) where the View Desktops are being stored. The second Active Directory account that needs to be created is a service account that will be used by Horizon View to access vCenter. Because Horizon View has a number of different configurations, the actual rights required by vCenter will vary. I will be using View Composer in this series, so I will be setting up the vCenter Service Account with the permissions required to use View Composer. Note: If you are not using View Composer, or you plan to use View Composer and Local Mode, different permissions will be required in vCenter. Please see Chapter 8 of the Horizon View 5.2 Installation Guide for more details on the permissions that need to be assigned to the service account. The user account that is created for accessing vCenter Server should be a standard domain user account. Unlike the View Composer, it shouldn’t have any rights to administer objects in the domain as the permissions that this account needs will be assigned within vCenter. 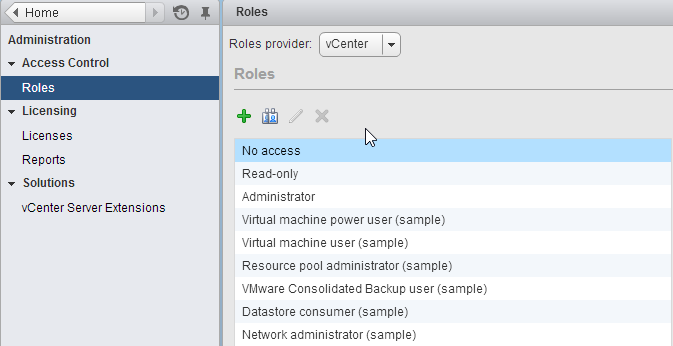 To create a new role in the vCenter Web Client, you need to go to Administration –> Roles from the main page. This will bring up the roles page, and we can create a new role from here by clicking on the green plus sign. Edit June 16th, 2014 – The Datastore permissions were missing from the list of permissions needed for the vCenter Service Account. They have now been added in. Note 2: The documentation says to grant all permissions to State under virtual machine. However, in vCenter 5.1 and later, there does not appear to be an item called State. The state item existed in earlier versions of vCenter and was renamed to Snapshot Management. For more information, please see this post by Terence Luk. This wraps up the preparation work for configuring Active Directory and vCenter to support a Horizon View deployment. Now we can start installing the components for a Horizon View environment beginning with View Composer. VMware Horizon View does not support the Windows Server 2012 Active Directory Domain Services (AD DS) domain functional level. You can use Windows Server 2003, Windows Server 2008, and Windows Server 2008 R2 AD DS domain functional levels with VMware Horizon View. When I wrote this back in January, that clarification wasn’t there. They have updated the release notes since then.